I wasn't really feeling it with this episode either. It wasn't egregiously offensive like the last episode, but I couldn't buy into it either. For one thing, infecting Nico isn't all that different from holding Saki hostage. At this point, it's sort of like, "Hey guys, why don't you band together and take out Chronos already instead of fighting amongst yourselves? It looks like you're going to do that in an episode anyway." Did we already forget that Nico and Poppy can transform. There's one point in the episode where she's holding her driver, but then just stands in the background, content to watch Ex-Aid doing the fighting. Wha? Does death really mean anything in a show where you can come back as an avatar? It seems like the writer tries to address that issue at some point, but sort of in a hand wavey way. I wonder if little kids really think Parado is dead. Even before Emu says "Ore" it doesn't ever really feel like Emu is really going to kill Parado. I'm not a writer, so I don't really know what they could have done to fix it, but none of it felt convincing. -I think the level system kind of screwed the battle scenes. There's no dramatic tension whenever anyone fights. You already know that 90% of the time whoever has the higher level will just straight up win. I hope the next episode is better, but this was a real 3 out of 5 star set-up episode. I wonder what the end game is going to be like. Speaking as a writer, I feel like they pretty much explained exactly how the Parado dilemma was to be solved. The thing is, Parado had to "die" in order for Emu to get the trophy, and for that, Parado had to believe he was really dying. Dan had to believe Parado was really dying. And most important, Chronos himself has to believe Parado has died. Considering a certain one of Ex-Aid's abilities, it was a really easy thing or Emu to pull off. And with Parado being essentially out of hte picture, Chronos is now going to make mistakes thinking his only true threat is defeated. Pretty standard stuff, just done in a more creative manner. But the writers are making some pretty bold moves when it comes to justifying how life exists. The whole argument about Nico is a good example of this. Dan is fine with her dying because she can just come back in digital form. He doesn't understand the value of human life because, to him, becomig a Bugster is a form of evolution. It's kind of the Orphanok dilemma all over again. Oh, and I know everyone knows the title character will always return, but seriously, that preview was about as hair-rendingly unnecessary as the Transformers movie commercial where they reveal that Unicron is a Transformer halfway through and ruin one of the two biggest shockers in the whole movie. Man up, Toei, and remember you used to have bloody massacres and kill key characters off all the time. Kids haven't suddenly become too fragile for the topic of death! Something is clearly afoot. Emu doesn't take enjoyment in eliminating people like that, even if it is to save a patient. He's determined, not cold. So that he would be so heartless to Parado, something must be up. Overall I really liked this episode, even if I'm highly skeptical that Parado is gone for good. It took a bit of a dark turn with Masamune's gambit and Executioner Emu. And the underwater/drowning stuff is incredibly unnerving. We finally got some good fights this week, both between Paradox/Chronos and Paradox/Ex-Aid. They weren't especially flashy (I'm still waiting for that Hyper Muteki over-the-top fight, Toei!) but both were rather physical and well done. As Takenoko pointed out, the rolling clouds were a nice touch. It's perhaps a bit obvious that they're in front of a green screen, but i can work with it. That and staging their fight in the (figurative) shadow of the Genm, were both very good choices artistically. And while he wasn't the focus (or even the B-plot) of this episode, I liked the handful of moments they gave Dan. He's not going to admit it, but he has a personal stake in this (presumably eliminating his father for all that he's done). At the same time Ashki is absolutely right in that Dan (still) doesn't understanding the meaning of life, which gives an interesting, albeit not completely valid, outlook to the situation. Meanwhile, I'm left to wonder quite where the show is going with its big bad. Gamedeus obviously has to show up at some point. But I can't see the show killing Nico or leaving her bedridden for the rest of the series. So somehow Nico is going to have to be cured while at the same time giving another avenue to Gamedeus to be born. Right? Ever since the start of KR Chronicle it's been obvious that he's considered himself and his quest in the right - that this is justified by the humans' arrogance - but it's very interesting that he considers himself the protagonist of the game. I suppose it makes sense, since he considered the Riders to be the game's enemy characters. It's an interesting juxtaposition since the Bugsters have by and large been the enemy characters of their respective games. Which makes me wish we knew a bit more about Knockout Fighter and Perfect Puzzle; maybe Parado really is a protagonist character in those games, like Poppy is to DoReMi-Beat? Emu said "Ore" after defeating Parado. Maybe he sucked him inside or something (shades of the Demia project here). Remember that fight against Kaiden, where he phased and skipped over him? He could've done something like that. Brilliant. At first I didn't understand why Chronos can Pause again, UNTIL I realized he released the virus onto Nico! 5 claps for the writer of this ep, please! In other words: Parado and Graphite's plan vs Chronos totally backfires against them (Parado especially). What I do not like is that Toei is using the female characters as pawns or hostages yet again. . . I actually think this is Emu trying to pull some kind of ruse. There is no way he'd straight up and kill Parado knowing he's the only one that can beat Cronut. That beatdown was brutal though. emu becomes cold and easily kill Parado kinda seems odd to me. and even if it's supposed to be shocking, the preview of next episode kinda ruin it since we see Muteki slams Chronos with his dread this time. the way parado comes to end route like this kinda feel pathetic for him, once looks so strong now tremble in fear and just kinda being some creature that wait someone to finish him sooner or later. Man. this episode was incredible. Also take, we may have to wait till the movie, because is ending next month. Quote: " I can cut through anything " - Proceeds to fail at cutting through the monster. I don't know how to feel about this episode. We get a lot of handwavium. Saki's dead? (handwavium), Chronus infects Ride Player Nico when? (handwavium), Para-Dx doesn't utilize his perfect puzzle abilities or even utilizes his finishers when fighting? (handwavium). I did enjoy two scenes from this episode. The first was when Chronus used his critical sacrifice attack and allowed it to slow down to mess with Para-Dx. I do enjoy my villains enjoying messing with their prey. The second was when Hyper Muteki grabbed Para-Dx and recited the lines given to him before about receiving the "ending" he deserved. It was cold and evil. Hyper Muteki wasn't the hero in that scene and I loved it all the more for that. Now some more things I didn't like. What's exactly wrong with being a bugster? Also isn't it more like virtualization than actual death? So it's more a form of evolution than actual killing. I don't see how that's a bad thing. This also confused me with Heisei Generations. Why are these bad guys again if they want to end the diseases of the world, and save people? I'm having a hard time connecting with heroes who are like: "I know your mother has a fatal illness, but you have to trust us and the fact we have no way to cure her so she's going to die over this guy who can digitize her and cure her because evolution is bad bad bad. " like what? BuildZaWorld wrote: I don't know how to feel about this episode. We get a lot of handwavium. Saki's dead? (handwavium), Chronus infects Ride Player Nico when? (handwavium), Para-Dx doesn't utilize his perfect puzzle abilities or even utilizes his finishers when fighting? (handwavium). I did enjoy two scenes from this episode. The first was when Chronus used his critical sacrifice attack and allowed it to slow down to mess with Para-Dx. I do enjoy my villains enjoying messing with their prey. The second was when Hyper Muteki grabbed Para-Dx and recited the lines given to him before about receiving the "ending" he deserved. It was cold and evil. Hyper Muteki wasn't the hero in that scene and I loved it all the more for that. 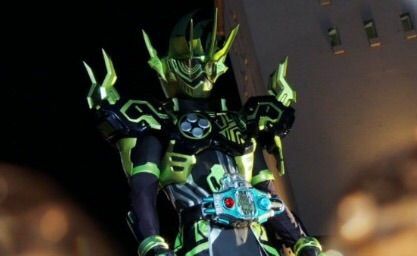 From how I see it, being a Bugster would result in the populace at large being un-trusting of you given the events of Chronicle, even with a human appearance you would still represent that which terrorised many people, similar to how people reacted back in Gaim. Fear is a powerful weapon afterall. I rate this episode 5. Why? Because this episode give me something that I didn't expect. 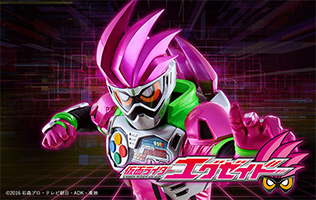 Ex-aid overall for me is a mediocre series because everything was so predictable and it design was meh. When there's trouble in an episode, they will overcome it easily, there must be solution. When it said by killing Paradox will make Emu lose his power, I was thinking that Emu will never kill Paradox, they will come out with solution to overcome the situation. But this time no, Emu killed Paradox mercilessly and didn't think Bugster as a human being. Bravo Emu, you grown up and not become that loser Emu anymore. But I don't know how they will settle everything after this because Emu lose his power. iori93 wrote: But this time no, Emu killed Paradox mercilessly and didn't think Bugster as a human being. Bravo Emu, you grown up and not become that loser Emu anymore. But I don't know how they will settle everything after this because Emu lose his power. How is it good? Especially in a franchise that's said numerous times how using your powers for revenge or to hurt others is a bad thing. iori93 wrote: Bravo Emu, you grown up and not become that loser Emu anymore. But I don't know how they will settle everything after this because Emu lose his power. But isn't that obvious fakeout itself predictable? WAIT Parado didn't die in paused time, he should revive again! njb wrote: WAIT Parado didn't die in paused time, he should revive again! He's not a fully realized bugster. He hasn't killed his host (Emu).